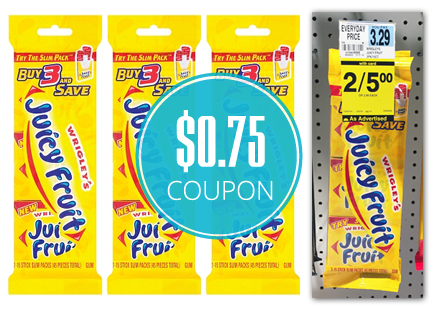 This week at Rite Aid, Juicy Fruit multipack gum is on sale, two for $5.00. Buy two three-count packs and use two $0.75/1 printable manufacturer coupons. The final price is $1.75 each, or $0.58 per pack! Total $3.50 or $1.75 each after coupon!